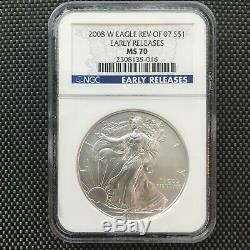 2008-W American Silver Eagle Burnished NGC MS70 Reverse of 2007 "EARLY RELEASES" "BLUE LABEL". For the first time in the American Silver Eagle series, a significant variety was released in 2008. This was known as the. 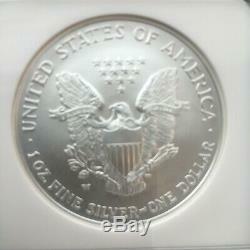 2008-W Silver Eagle Reverse of 2007 Variety. The US Mint had slightly altered the reverse design between 2007 and 2008, and they inadvertently struck some 2008 coins with the 2007 reverse type. The variety occurs on the 2008-W Uncirculated Silver Eagle. The variety can be identified by examining two aspects of the reverse design. On the Reverse of 2007, the U in United States will be bowl shaped and the dash between the words Silver and One will be shaped like a tilde. On the reverse of 2008, the U will have a spur on the right side of the letter and the dash will be angled. The Reverse of 2007 Variety is the scarcer version of the coin and carries a big premium. Shortly after the discovery of the coin, the US Mint estimated that approximately 47,000 of the variety may have been released. This estimate was based on the fact that West Point Mint employees found 15 dies with the reverse type of 2007. The mintage estimate was later revised to 46,318 within a response to a Freedom of Information Act request. Both PCGS and NGC attribute this variety as Reverse of 2007. Top graded examples of this important variety have been in strong demand since the initial discovery. The coin in the photos is the one you will receive. The item "2008-W American Silver Eagle Burnished NGC MS70 Reverse of 2007 EARLY RELEASES" is in sale since Saturday, February 23, 2019. This item is in the category "Coins & Paper Money\Bullion\Silver\Coins". The seller is "dchorzem4v1v" and is located in Saratoga Springs, New York. This item can be shipped to United States.